CARACAS, Venezuela -- The disputed jailhouse death of an opposition councilman arrested on allegations of plotting to kill President Nicolas Maduro has triggered alarm among many Venezuelans and swift condemnation from several foreign dignitaries. Venezuela's government said on Monday that Fernando Alban took his own life by leaping from the 10th floor of the state intelligence agency's headquarters. But opposition leaders denied the official version and a few dozen of Alban's supporters gathered outside the building yelling "Maduro killer!" contending that he had been murdered. "There's no doubt this was an assassination," opposition leader Julio Borges said in a video from exile in neighboring Colombia, without providing evidence of his claim. "The only thing left for this government is torture, violence and destruction." Alban, 56, was taken into custody Friday at Caracas' international airport upon arriving from New York, according to his lawyer. He was in the U.S. accompanying other members of his First Justice party for meetings with foreign dignitaries attending the United Nations General Assembly. While Venezuelans last year watched as dozens of youths were killed in violent street battles with security forces, the death of activists or government opponents while in state custody is a fate more associated with the far deadlier, right-wing dictatorships that dominated much of South America in the 1970s. 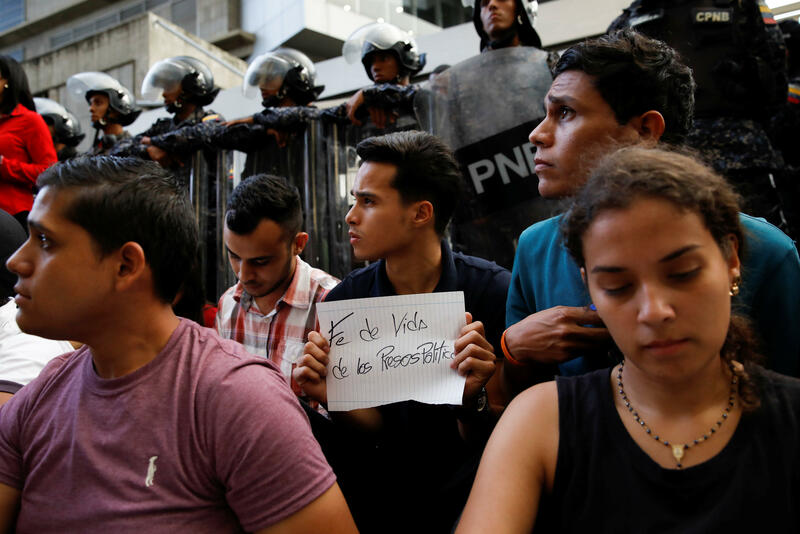 The opposition claims that more than 100 Venezuelans opposed to Maduro are being held as "political prisoners," some for more than four years, with little access to the outside world and their legal rights routinely trampled on. The government denies they are political prisoners. Some compared the incident with Alban to another suspicious death from Venezuela's own dark past: the passing in prison in 1976 of socialist militant Jorge Rodriguez, the father of current Vice President Delcy Rodriguez and her brother, also named Jorge Rodriguez, a top aide to Maduro. Also considered a suicide in its day, Rodriguez is now deemed to have died from injuries suffered from torture. Borges, who led the delegation to the U.N., said Alban's wife told him that her husband had been under intense pressure to testify against him in the ongoing probe into the alleged plot in early August to kill Maduro using two drones loaded with explosives. More than two dozen people have been jailed on suspicion of involvement in the plot, which Maduro claims was orchestrated by Borges with the support of Colombia and the U.S.
Chief prosecutor Tarek William Saab ordered an investigation into the circumstances surrounding Alban's death, which he classified as a suicide. Republican Sen. Bob Corker, the outgoing chairman of the Senate Foreign Relations Committee, who is in Venezuela for meetings with Maduro and his opponents, called Alban's death while in the government's custody "disturbing." "The government has a responsibility to ensure all understand how that could have happened," he said in a message posted on Twitter. Also expressing concern was Venezuela's Catholic bishops' conference and Luis Almagro, the head of the Organization of American States and a sharp critic of Venezuela's socialist government, who called Alban's death "the direct responsibility of a torturing and homicidal regime." As night fell on Caracas, and rumors swelled on social media that the government was planning to cremate the body to hide any signs of torture, family members gathered outside the morgue to demand Alban's body be handed over. Borges, who said Alban was a personal friend, said the councilman who represented a district in the Caracas area was a family man and devout Catholic who would never kill himself. "Alban is a very Christian person, with deep spiritual convictions that go contrary to a decision to take one's life," said lawyer Joel Garcia, who has represented Alban. He said he met with Alban the night before in the tribunal and his client had seemed calm. Garcia said authorities cannot determine that a death is a suicide without an investigation and he would ask to be present at the autopsy.